While Halo Tree Service may specialize in tree trimming and tree stump removal, we still certainly love trees and how beautiful they are. Trees, when trimmed nicely, can take any property from ordinary to absolutely gorgeous. Here in Michigan, where beautiful wild oaks and towering maples populate the green grasses, every season is something new. Between the flowering Dogwoods in the spring, to the deciduous tree leaves fading into a burnt-sunset hue in the autumn, our lovely Midwestern state is accustomed to the beauty of trees. Our tree trimming company loves how trees add to the aesthetic and, while they’re magnificent on their own, trees can also be fun to decorate! Today, we’re going to talk about some fun tree decorating ideas to spruce up (no pun intended) the exterior of your home! 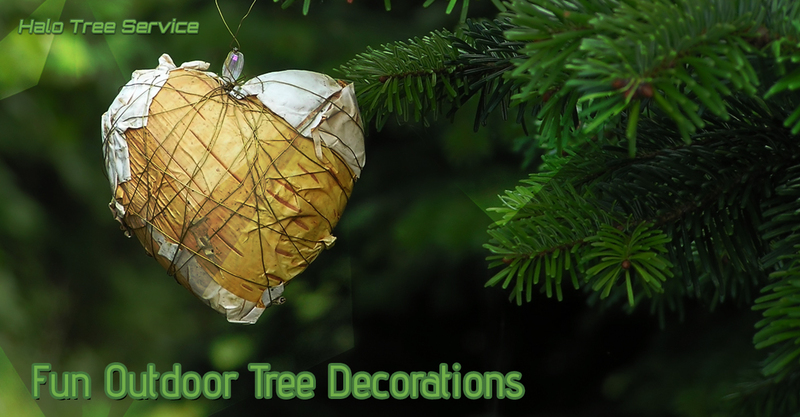 Here are some of our tree service’s favorite ways to decorate trees! Turn your backyard into a fairy garden by weaving string lights through the branches. This little touch is simple and elegant, yet stunning. The string lights resemble little fireflies fluttering through the leaves at night. What’s even more fun is that many hardware and homegoods stores supply a variety of string lights in different colors and shapes, so you can get creative! However, make sure not to attract too many fairies, those buggers sure make quite a lot of racket! Birdhouses add an extra dose of cute to any type of tree and they allow you to get really creative depending on the exterior of your home. Go for a modern birdhouse with copper wiring or opt for a classic wood one with painted flowers. What’s great about birdhouses is that birds actually do come and build nests in them, especially if humans don’t come near it too often. Hang it up, leave a little birdseed, and watch your tree go from a regular ol’ tree to a brand new home with a family! Our tree trimming company has a special place in our hearts saved for trees with little faces on them. Ridiculous as they may be, they’re quite funny. You can find these little woodland faces at many home and garden stores. Surprise the neighbors and transform your simple tree into a person! Let’s just hope they don’t confuse the tree with you. We’ve all seen those inspirational signs in homes and businesses. Why not put them on a tree outside? “No act of kindness, no matter how small, is ever wasted!” That’s exactly what a tree would say, because what’s wiser than something that’s been around before we even knew what an inspirational quote even was! We’re a tree trimming service, what did you expect? Halo Tree Services loves all of these unique and quirky decorating ideas, but we won’t play down the importance of having a freshly trimmed tree. Do we condone trees trimmed to resemble giraffes and flamingos, however? That’s a question for another day. Thanks for reading and give us a call for help with tree trimming, stump removal, and other tree related services!